Glenoid fractures are usually the result of blunt trauma to the upper extremity. Subtle fractures can be difficult to detect on conventional radiographs; CT may be required for full diagnosis. A special glenoid fracture is termed the Bankart fracture. 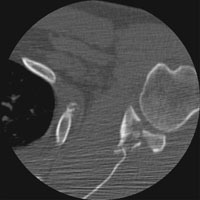 This consists of fracture of the inferior lip of the glenoid during anterior shoulder dislocation. A Axial CT. 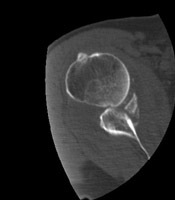 This image through the glenoid shows a comminuted intraarticular fracture. B Axial CT. 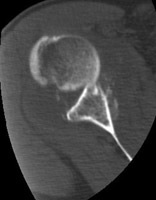 This also shows the comminuted intraarticular fracture of the glenoid. C Axial CT. This image shows a Bankart fracture.